State Bank of India said IMPS transfers from Rs 1,000 to Rs 1 lakh will attract a charge of Rs 5. The charge will be exclusive of applicable GST. SBI or State Bank of India has revised charges on IMPS, or Immediate Payment Service, money transfer service. 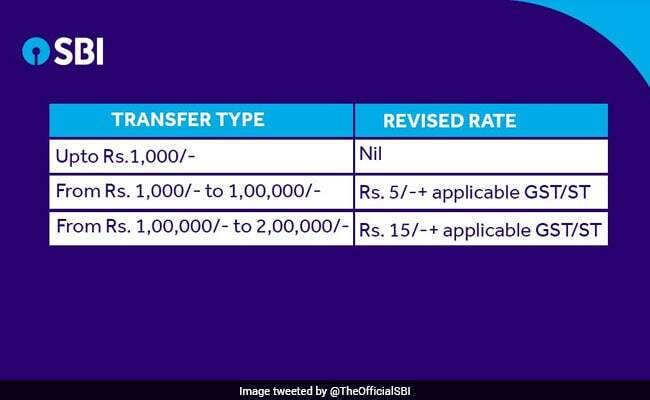 Giving the new IMPS rates in a post on microblogging site Twitter, India's largest bank SBI said IMPS transfers up to Rs 1,000 will not attract any charges after the revision. SBI completed 62 years of operations earlier this month. IMPS is a money transfer service that can be carried out though mobile phones or internet banking. The IMPS service helps to transfer money to the beneficiary's account immediately when a fund transfer request is made through mobile phone or internet banking. The IMPS service is available 24x7, including holidays. SBI further said IMPS transfers from Rs 1,000 to Rs 1 lakh will attract a charge of Rs 5. 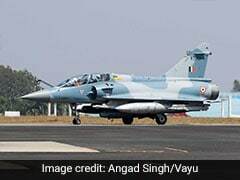 The charge will be exclusive of applicable GST. Also, transfers from Rs 1 lakh to Rs 2 lakh will attract a charge of Rs 15 plus applicable GST, according to SBI. GST subsumes more than a dozen state and central levies including service tax. Therefore, many banks including State Bank of India have revised their charges in the context of GST. Under the new GST regime, banking and financial services will attract tax at the rate of 18 per cent. In another post on Twitter, SBI has said that GST will remove the cascading effect of tax on the cost of goods and services, and production costs will decrease. Earlier this year, SBI joined the league of global top 50 banks after merging its operations with five associate banks and Bharatiya Mahila Bank. On April 1, State Bank of Bikaner and Jaipur (SBBJ), State Bank of Mysore (SBM), State Bank of Travancore (SBT), State Bank of Patiala (SBP) and State Bank of Hyderabad (SBH) became part of SBI.